How to get around and provide for ourselves ? Daniel Chotard has created and built many different opera backgrounds and; therefore, has developed many different technical skills, which he would love share and teach to other artists.You can learn during a course or individual lessons, the art of welding or the use of special tools. 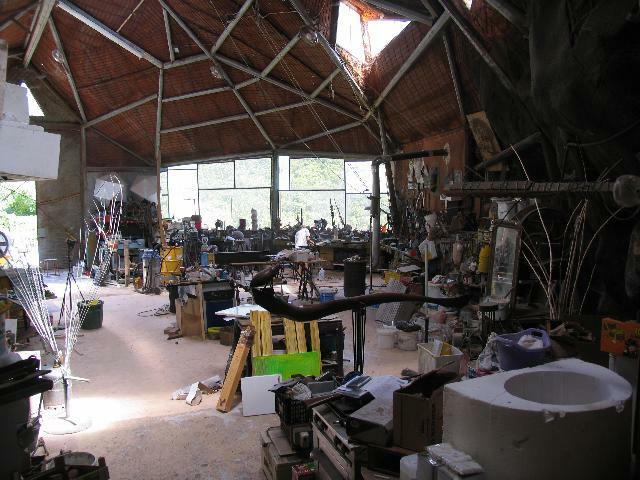 We should mention in connection with the studio use, that all materials used or the worn-out parts of tools used must be paid for. For example, lime- discs or gas; likewise, the materials which you use for your project. Naturally, you may bring your own personal tools and materials along. Incase you require special materials for your project, let us know in advance, and we can order them for you. That way, they will be waiting for you, when you arrive. How can I work ? - you plan your stay with us during a time when a course is offered. - you become enough advice before starting your project. Welding requires the above conditions; except, you then need 2 to 3 hours of instruction. (Plus costs for used metal and gas). In the case of wood or other materials, individual conditions at the location can be worked out. In case you find yourself without an idea, the surroundings here will surely inspire you.